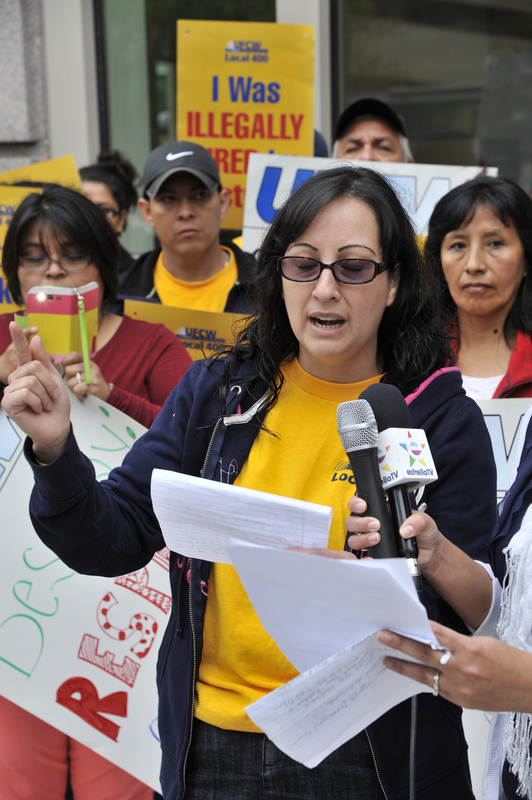 Workers at Bestway, a Latino supermarket in the Falls Church, Va. suburb of Washington, D.C. came together in September to form a union at their work. However, their company ignored their requests to bargain and instead engaged in systematic illegal retaliation against union supporters by cutting hours, changing schedules, holding one-on-one interrogation meetings and threatening to call immigration on the workers. But workers at Bestway stayed strong and held together and staged a work stoppage to protest the company’s illegal conduct. The company responded by firing 31 workers in attempt to silence the workers. The workers continued to hold strong against the company threats and intimidation. They staged a daily picket line outside the store to educate customers on the unfair treatment and violations of labor law. After seeing a noticeable decrease in business, Bestway reached an agreement with workers to reinstate all terminated workers, recognize UFCW Local 400 as their union, provide back pay to terminated workers, and begin contract negotiations with workers this week. Metilde Reyes is one of those workers. Metilde Reyes is a mother of three that has worked at Bestway for 13 years. The company calls her a “supervisor,” but she gets no extra pay or better treatment from her position. She works to make sure the cashiers work together to check customers out and to void merchandise when necessary. When Bestway illegally fired her coworkers for standing up, they offered her extra money and more hours to train their replacements, instead, she joined her coworkers in protesting in front of her store. Together, Bestway workers like Metilde are negotiating for better wages, benefits and working conditions. But that’s just the beginning of their journey – they’re now working to show workers at other Bestway stores what’s possible when workers come together. “I can’t wait for the day when workers at all Bestway Supermercados get the same rights that we now have at our store,” said Metilde.